W.C. Fields professed to love Gabby Hayes and laughed heartily at the bearded one’s screen antics, deeming Hayes a very funny fellow. I love all the western sidekicks. They’re my heroes. When I was a kid a B-western without a sidekick made me want to go out and get my dime back. Sugarfoot was a natural born sidekick, and I snuck in as many funny bits as I could get away with. One of my all time favorite sidekicks is Pat Buttram. The word genius is bandied about Hollywood like a shuttlecock, but if there ever existed such a creature as a genius cowboy sidekick, it was Pat Buttram. What a happy trail he followed working in radio, stage, TV and movies, building a fine reputation as humorist, MC and writer along the way; sort of a PG rated Will Rogers. Born in Addison, Alabama, the son of a circuit rider minister, Pat was a theology major at Birmingham Southern College until he made an abrupt career move and went to work as a radio announcer. With his unique voice he sounded not unlike a cross between a Swiss yodeler and a pig caller. His stint on “The National Barn Dance” lasted 13 years. 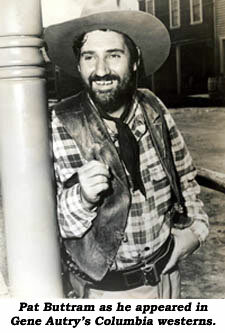 Pat became Gene Autry’s sidekick on radio, in 17 feature films and 73 half-hour TV episodes. Autry says, “I gave him his start in the business. We needed a man to follow Champion, with a broom and shovel.” But Pat got the last laugh when he married Sheila Ryan, Gene’s lady fair in “Mule Train”. They stayed married for 23 years until her untimely death. For seven years we watched Buttram on TV in “Green Acres” as the wily Mr. Haney—I reckon he was just playing himself. Perhaps, his greatest achievement was creating the Golden Boot Awards back in ‘83. Thanks to the Boots, well over $1,000,000 has been raised for my favorite cause, the Motion Picture and Television Fund. I have fond memories of encountering Pat from time to time. He could be a crusty curmudgeon on occasion, but, as we all know, comedy is a serious business. The bottom line is, underlying the man, there was a strong current of humor, sharp wit, humanity and love. He was great with famous last words—“Toulouse Lautrec: I knew I’d have bad luck when I walked under that black cat.” He never let up on Autry’s Angels—“And in conclusion I’d like to say the L.A. Angels had one of their best years ever. Boy, would I like to say that!” Wouldn’t he have been a wonderful MC for the Oscar Awards? The last time I saw Pat was at a collector’s convention in North Hollywood. He was walking toward his car in the parking lot. I spoke out to him, telling him of my admiration and thanking him for all the laughs. He smiled wistfully, waved and walked off, no doubt to pursue his hobbies: “Humming softly, weaving, pewter ware, collecting old echoes and watching my bananas ripen.” His motto was: “Westerns will always live in my heart and pay no rent.” Adios!